I’m really happy to have Anna Runyan as my guest today. She has had a very interesting career, taking her experience in the professional world (as a consultant with an MBA) and becoming a successful entrepreneur. She loves to teach, so getting into her own business (and you’ll read more about what that is) came naturally. Anna has accomplished a lot during her entrepreneurial journey, including making it onto a “Forbes list,” something she’s always wanted. Not only does she know what it takes to succeed in a business or a career (just through experience), but she’s helped many people figure it out as well. Lots of good tips here – keep reading! Anna, it sounds like you’ve come a long way since starting your blog, Classy Career Girl, over four years ago. Tell us a bit about yourself and your journey – Before you became an entrepreneur, what did you used to do for a living? What led you to creating your blog, and where has it taken you today? I worked at Booz Allen Hamilton for 8 years so most of my experience has been consulting for the military in a male-dominated work environment. I learned a lot and my passion for my blog has always been to give the advice that I received and the advice I wish I had received for my career. I started my blog as a side project during my MBA. It gave me an outlet to blog about what I was learning at business school and on the job (I was still working full-time). Eventually, women started reading it and I started giving more and more career advice. I discovered I loved career and leadership coaching and training. At the time, I started teaching classes at my company about how to navigate your career. I LOVED it and realized that I wanted to teach all the time. So I started teaching webinars and courses and helping professional women take their careers to the next level. My blog is filled with career and leadership advice for women to help them take their careers to the next level. Initially I was completely anonymous because I was worried I was going to lose my job. I then realized that people were looking to me for advice and I felt like I was hiding and scared because I wasn’t being true to myself. So one year into my blog I put my name and photo out there and the interaction with my readers skyrocketed because I was authentic and totally me! It also felt great and my boss didn’t care at all. She actually learned about my blog when I was featured in a People Stylewatch magazine and she happened to be reading it on vacation. She was very supportive and thought it was awesome what I was doing in my spare time. How were you able to make the leap to leaving your full-time job? One of the biggest inspirational stories (and most read blog posts) I have is how I got out of debt (15 ways I paid off 80K of debt –my most read blog post). Getting out of debt actually freed up my career to focus on something I was passionate about – writing a book, teaching and growing a business. Because I got out of debt, I was able to go part-time at my job. And the best part about it is that as soon as I went part-time at my job, the opportunity to teach as a Professor at DeVry University came up. This was also a dream and something I never would have done if I hadn’t gone part-time. So that is why I am such a huge proponent of getting out of debt. I used Dave Ramsey’s The Total Money Makeover book. The easy baby steps really worked for me. What has been your greatest success (or successes) so far? One of my biggest goals from the beginning has always been to make a Forbes list. Just this past fall I made Forbes “Top 100 Websites For Your Career” and Forbes “Most Influential Career Sites for 2014.” I was ecstatic because this was a BIG dream come true! Better than that though are the speaking engagements and people I get to meet from my blog. I will never forget my very first speaking engagement came from a blog reader from Wake Forest University that asked me to come speak at her college. And now I am speaking at Universities, Corporations and Women’s groups at least twice a month! If I never would have posted blog articles with my advice and started creating videos offering my tips, that reader never would have asked me. All successful people fail throughout their journey to success. What do you consider to be your biggest failure, and what did you learn from it? It’s funny because I believe that all failures are really just learning blocks; I don’t have any major failures because everything has helped me get to where I am today. The first thing that comes to mind is putting a ton of time into creating a product and no one buying it. That taught me to start surveying my market before putting a product out there. I think other times I have failed are when I just start something and try to get it out there too quickly rather than really spending a lot of time to make it great, especially planning out the marketing and launch. I have created a lot of products but failed putting together a launch calendar. That is something that I spend a lot of time on now. Can you give us a specific example of a breakthrough you’ve helped someone through – maybe one that sticks out in your mind as an exceptional story? What was the person struggling with, and what was the outcome of your coaching? One of my clients came to me unhappy and was wondering if she should continue sticking it out or go to another company. She didn’t have a career advancement plan and had a ton of goals and dreams but was just stuck in her current role. She had a ton of interruptions, needed a new title, needed confidence to talk with her boss, needed an assistant and a plan to communicate with her team better. I had her take a personality assessment and discover her leadership strengths; she figured out she wanted to stick it out at her company, and she created a networking action plan and a time management plan so she was less stressed out. We created goals and a timeline together and we walked through my female leadership success formula that I teach in my Female Leadership Academy. Her results were weekly meetings with her boss, a new office, more confidence, an assistant hired, a bonus and promotion, more responsibility, peace of mind and happiness and less stress. She was also more organized and learned strategies to say no. For someone who is currently stuck in their “9-to-5” job and really wants to break free and either find a new job or start their own business, what are some good first steps? What do you wish someone told you when you first realized you hated your day job and wanted to escape? Start a side hustle instead. I started out doing job search coaching including resumes and interview preparation coaching. What I realized is that I love leadership development coaching much more and that is why I wrote a book on it. It took me three years though to figure out my right niche that I loved and fit me. So don’t worry about it being perfect in the beginning. Just start somewhere. Your clients, market, niche and passion might change and that is OK. You have to figure it out somehow and the only way you can figure it out is by starting somewhere. Let’s take a step back and look more generally at running a blog or business online. If you had to take your best advice and put it into one sentence or phrase, what would that be? I am an introvert, so staying behind my computer screen really worked well for me. But, that was the easy way out and my income drastically increased when I hired a coach, joined a networking group, had my first live event and invited people I had never met to come hear me speak. It was so scary and I had to get over a lot of my fears but that was my big breakthrough in my business. Evernote: This is the place I store all of my notes and important emails. It is my homebase and I would be lost without it. I love that I can get it my laptop and phone. Hootsuite: This is where I schedule my tweets and watch my Twitter lists to see what is happening. I am a member of Ali Brown’s Elevate training program, which has been a life changer for my business. You can learn more here. Focus at Will and Songza are the two apps I use to listen to music while I work. Songza has perfect stations and Focus at Will times you so you don’t work hours and hours without a break. It tells you when 60 minutes is up and when you need to take a break. 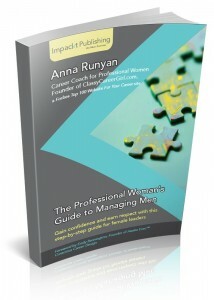 My book out this February called The Professional Woman’s Guide to Managing Men. Thanks for taking part in this interview, Anna! What’d you think of today’s interview? Leave a comment below!